Nothing there to worry about, right? 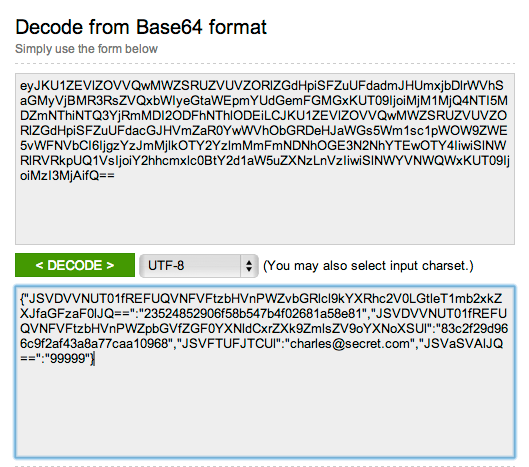 Doesn’t look like humans can read it, does it? Anyone else I share that link with, when they click it, will be taken to the Organizing for Action page and shown my email address and zip code. Regardless of the risk, I am fairly certain (just about all of) the people involved did not intend to publicize their email addresses and home zip codes on Twitter. For an update on this topic, please also see my more recent post. Pretending it doesn’t exist is impossible. During today’s (Saturday 9/22) MHP show, roughly 20% of all Tweets using the #nerdland hashtag were spam. But because the #nerdland hashtag popped in and out of the trending topics list throughout the show, at #nerdland’s peak somewhere between one-third and one-half of all Tweets were spam — and started to crowd out the real tweets. (The SPAM SPAM is not part of the original tweet, but is a flag my Twitter client puts in when it detects spam tweets — see more later in this post). Twitter spam almost always has a URL click. In the case of today’s attack, it ultimately took you to an AOL job listing site where, presumably, the spammer gets paid if you use the site. The text of the spam is usually unrelated to the show. And often it’s not particularly gramatical. This is because spammers use sentence generators — one popular one is called “spintext” — that generate sufficiently random sentences to avoid immediate shutdown by Twitter. A word of warning: you should never click the spammer’s URL. Today’s spam was fairly innocuous, but there are moments like just this week where hackers find a new weakness in a browser and may be able to infect your computer if you visit their web site, even if you have an up-to-date anti-virus and browser. (By the way, there is an update to Internet Explorer just released yesterday, 9/21 — make sure you get it!). The above screen shot is of a Twitter client I built that detects and hides spam (normally, that is: I had it just tag spam tweets with SPAM SPAM for this article). The client is free to use. It does not have advertising that gets in your way. The spam detection is evolving, but it basically looks for patterns in tweets that identify spammers with a very high probability and then prevents the client from showing them to you. 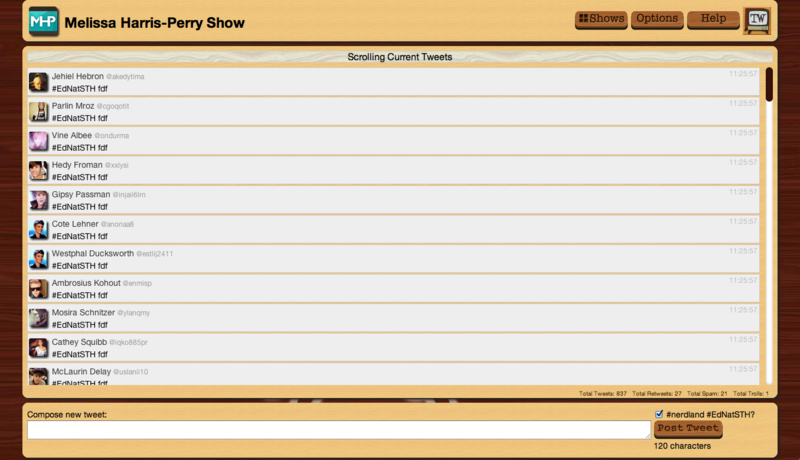 It won’t catch the first couple of spam tweets, but after a few of them it detects the pattern and kicks in. 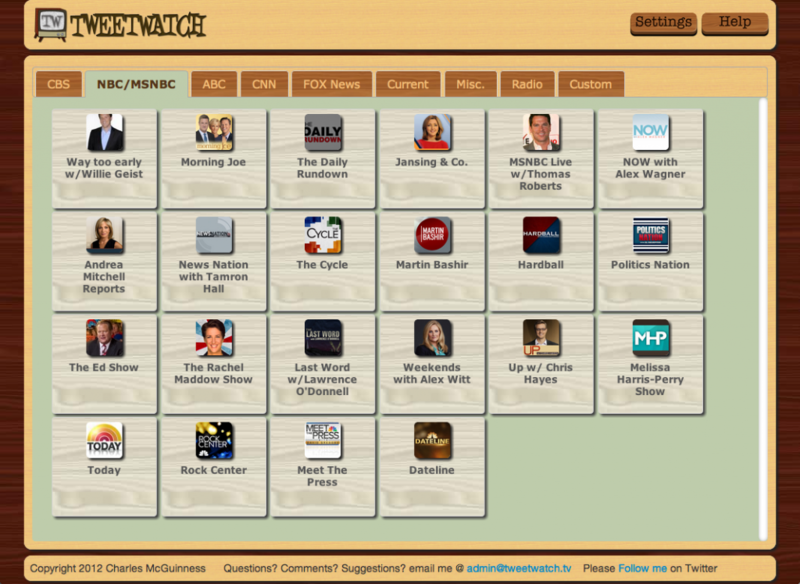 In addition to deflecting spam, the application specially designed for tweeting along with shows like the MHP Show or Up With Chris Hayes. I built it because I am a #nerdland fan and was frustrated with all the other ways to live tweet the show and was annoyed by spam and trolls. In addition to blocking spam, there are a bunch of other things my Twitter client does to make live tweeting a show more pleasant. It allows you to flag people as “trolls” and hide their tweets (which does not report them to Twitter, as most trolling is not really a violation of Twitter’s terms). It allows you to hide retweets if you wish (you’ve probably already seen the original tweet). 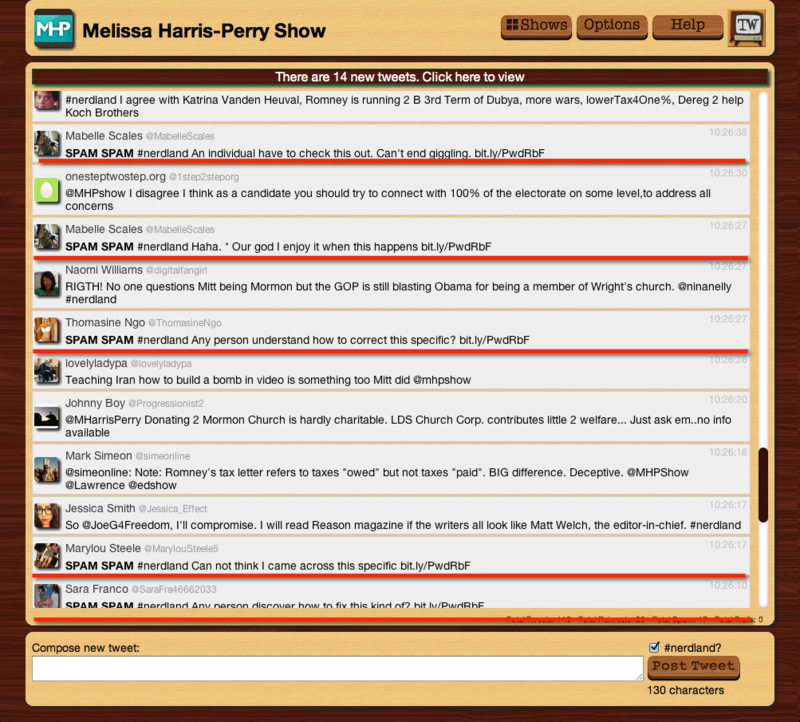 And it highlights Twitter users who are connected with the show (e.g., @MHPShow) so it’s easy to spot their tweets in the stream. I’ll continue to evolve the program to block spammers (as well as other improvements that are unrelated). Give it a try, and give me feedback — my focus is on making it the best possible Twitter client for following along with a show. And if you really hate Danish Modern, I apologize for my theming: I’m also a fan of mid-century modern. Pinterest has taken off like wildfire, reportedly reaching 10 million unique visitors faster than any other website. And on the surface, Pinterest is a blissfully spam free environment. Just lovely pictures. Nonetheless, the spammers have moved into Pinterest big time. And users are starting to notice. The first generation of spam involves the spammer posting hundreds of items that go to a spammer’s page which offers an item for sale. When the user clicks to order, it takes them to Amazon for purchase, and the spammer picks up an affiliate payment for bringing the buyer in. This kind of spam has gotten a lot of attention lately. But there’s novel approach that targets people based upon what they pin. Let’s say you pin a Gucci purse to your board. You are inadvertently advertising yourself as someone who owns or aspires to own a Gucci purse. And the criminals notice this. Still not a lot of information. But there’s a clue — I’ve added the red arrow pointing to the tip off that something’s amiss with the page. The URL pinleresl.com is clearly meant to look like pinterest.com. They want to sell you fake Guccis. This is illegal. A page full of fake Guccis for sale. Why? 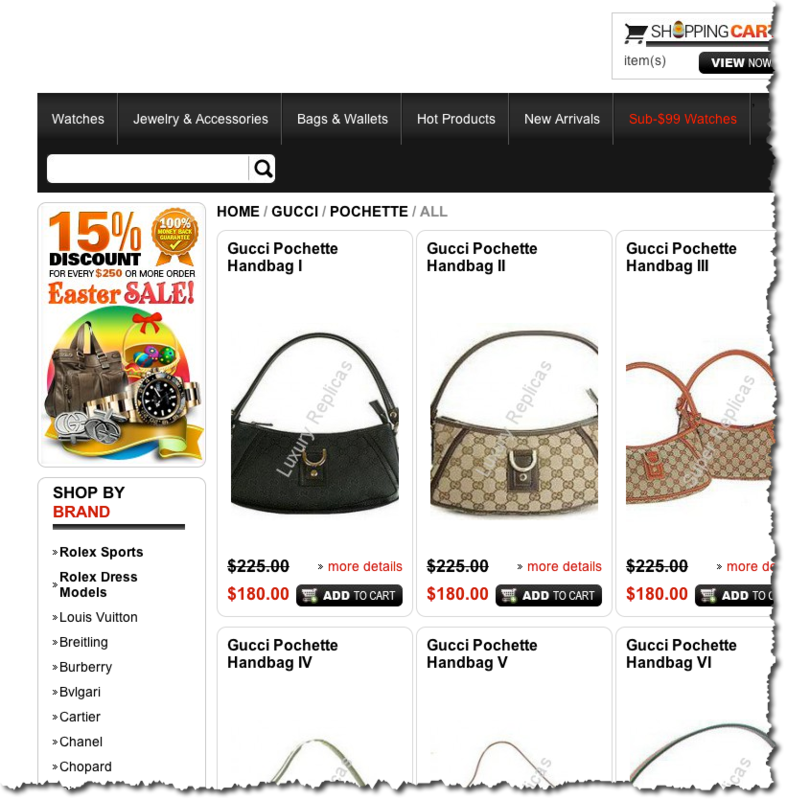 Because you like luxury purses, and this is targeted to you. 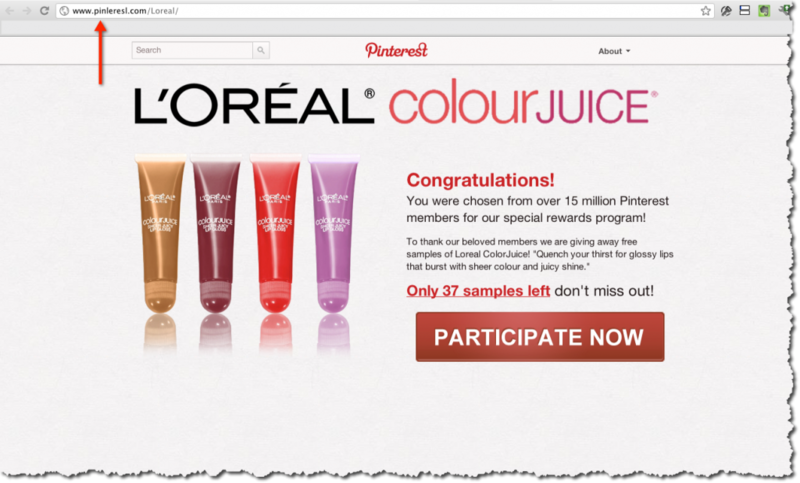 It looks like Pinterest is sponsoring a give-away of L’oreal products — but of course it is not. What is more likely is either that (a) it will try to pry enough personal information out of you to steal your identity or (b) it will try to convince you to install some sort of malware (I played along with one long enough to discover it wanted to install a tool bar in Google Chrome for me), or (c) all of the above. This kind of stuff is bad news if you fall for it. 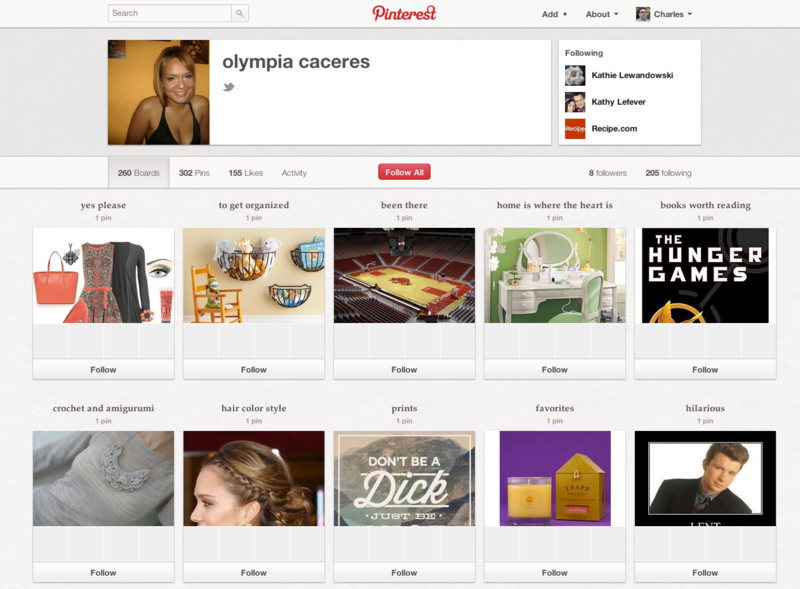 All the usual scams are out there on Pinterest — phishing, fake contests, malware. Everything on the Internet that is bad is just one click away. Again, the worrying thing about this is that the spammers aren’t just passively posting catalogs of products they want to sell like has been observed before. They are actively looking for users who express interests in certain brands or products, and targeting with focused content for knock-offs or phishing. You are being targeted by what you pin on Pinterest. This makes it much more likely that you’ll fall for the scam when it is about something you’re interested in. There are many other examples like this with fictitious Pinterest users whose pins all lead to bad things. Probably nobody knows how much of this is going on, but it is a problem that the brand owners and Pinterest are going to have to grapple with. The availability of spam-bots makes this sort of thing quick and easy to set up. My wife (the active pinner of the two of us) first alerted me to this problem, and so I sat down and ran through all her followers. I discovered that 50% of her followers are spammers/phishers/pirates. And she’s not unusual. 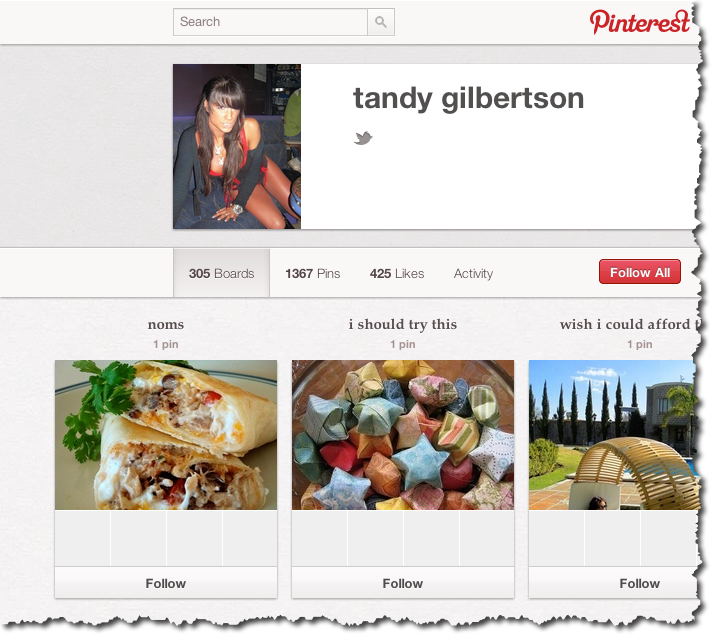 I looked at several of her (real) Pinterest friends and found pretty much that everybody was starting to attract a large collection of spam followers. 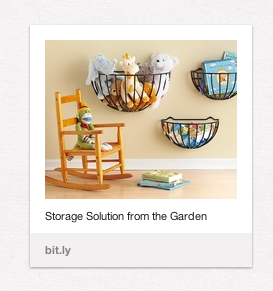 What’s especially pernicious is that unknowing Pinterest users are re-pinning spam. Let’s say you see a photo on Pinterest you like. If you don’t click through it, you don’t know where it goes. And so when you re-pin it, all your followers will see it — and if your friends click through (maybe just because you re-pinned it? ), they could be infected with a virus because of your repin. Is it your fault? No, you’re a victim too. But it’s insidious how this can spread from user to user like … a virus. You might have a couple boards with one pin, but every single board with one pin? Not real typical for a Pinterest user. And the description of a lot of these folks is blank. Just a name. So if the user looks unusual — lots of boards, but about the same number of pins as boards — it’s a reason to be suspicious. Not all of these people do this, but if you see a link shortener being used it’s a bright red flag. There’s a fair number of link shorteners out there, but if the web site doesn’t look real to you, it’s worth thinking about. 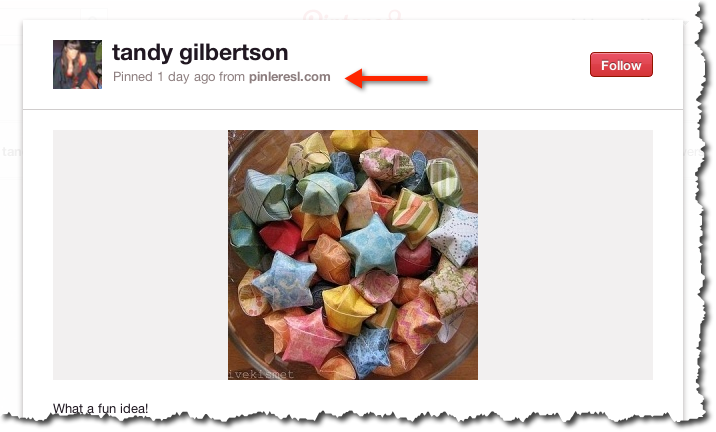 As a note, Pinterest should disallow the use of link shorters like this that hide what the real web site is. The URL is trying to fool you by looking like a real site, but is just trying to confuse you — see the second picture in this blog post for the “pinleresl.com” example. You know that’s bad news. 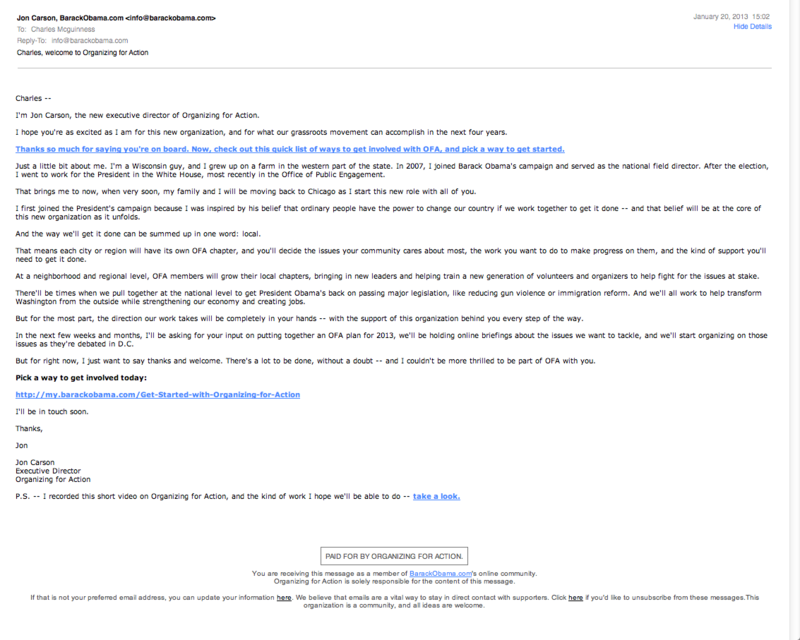 It looks official and real, but it’s totally fake and totally going to rip you off if you “Participate Now”. Again, the URL is the big give-away. Unfortunately, the problem with giving any specific advice is that the spammers are going to adapt quickly to any patterns we detect. So your best protection is to be wary, know that not everything is as it seems, and if it doesn’t pass the sniff test, get out. If I notice changes in their behavior, I’ll post updates as time goes on. You can follow me on Twitter (socialseercom), sign up for this web site (there’s a link somewhere around here to get notifications of updates), or just check in now and then. 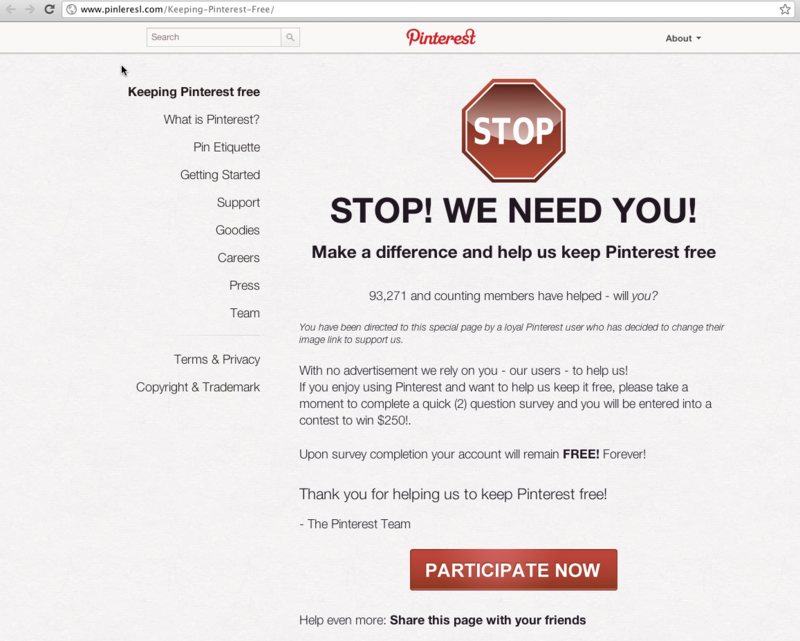 Caveat Pinner — and pass this along to anyone you know who uses Pinterest.